With my other commitments of the first weekend out of the way, I was now free to tackle films to my heart’s content. The difficulty of the programme’s breadth and depth is partly knowing what to tackle and partly having time to tackle it. So for the first time I went into a day at the festival without a fixed plan for the day, rather attempting to use on the ground knowledge to guide me to my most valuable watching choices. My first choice of the day very much made itself, as having seen both About Elly (as the very first film I saw at last year’s festival) and A Separation, I was keen to explore the earlier work of Asghar Farhadi. The only real mystery is why it took him a decade to come to international prominence, as all of the hallmarks of quality of his later works are present and correct here. Sure, it’s another domestic drama, but Farhadi has a gift for shading in his characters rather than casting them in black and white, and for intricate plotting which makes use of happenstance rather than feeling like it’s built on contrivance. 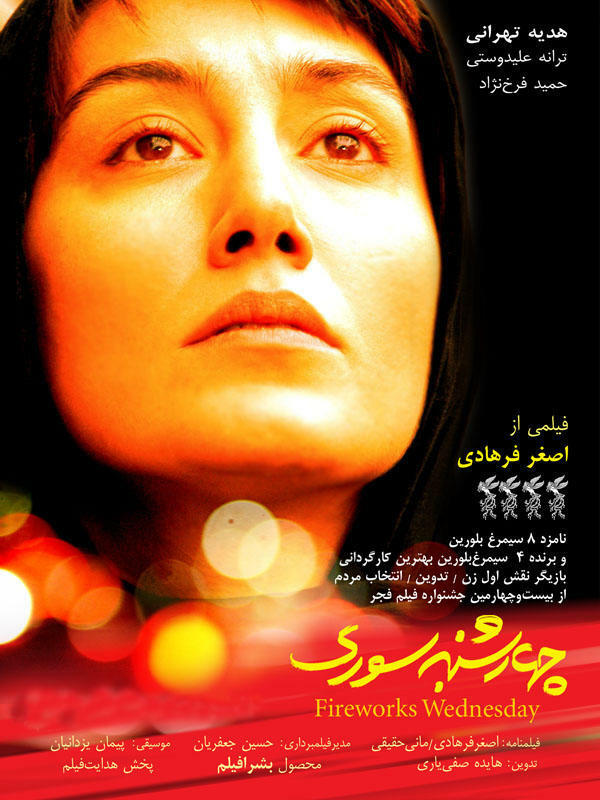 His films manage to reflect both the realities and the uniqueness of life in contemporary Iran but also the universal nature of human relationships and frailties. Fireworks Wednesday is neither as deeply fraught as About Elly or as tense and probing as A Separation, but it’s still well worth checking out if you’re a fan of either of his more recent works. I also wrote a longer review of Fireworks Wednesday for Take One, which you can read here. Having had around five hours sleep the previous night before getting up to write another Take One review, the thought of a 140 minute German costume drama (in the form of Ludwig II) was a little too much for me, so instead I took the option of prolific American director Joe Swanberg’s latest. At the age of just 32 Swanberg has clocked up an impressive seventeen films as a director, although he came to my prominence recently as an actor in the throwback horror You’re Next. All The Light In The Sky might come across as unusual material for a 32 year old director, dealing as it does with a woman in her mid-forties (Jane Adams, best remembered to me as Niles’ second wife Mel in TV’s Frasier) dealing with the direction of her life and her attempts at relationships, both of friendship and of something deeper. Despite everything in her life wearing away or feeling worn out, Adams’ Marie and her friend Faye embrace everything life has to throw at them, and Swanberg and Adams’ script – which feels heavily improvised – is warmly naturalistic and refreshingly honest, as are the performances. There’s no point being prolific if you can’t maintain quality, but if everything Swanberg puts his hand to is of this quality, it suggests he should have no concern about his current workrate. The film was preceded by short film Me, The Terrible, a charming confection featuring a young girl’s adventures with some crude animation mixed with live action. It was due to be followed by a Skype Q & A with Swanberg and Josephine Decker, the director of the short, but regrettably some confusion meant that only Decker joined the portion I attended. Despite that, it gave some useful insights into her working practices. I followed this up with a debut from Scottish director Jamie Chambers. 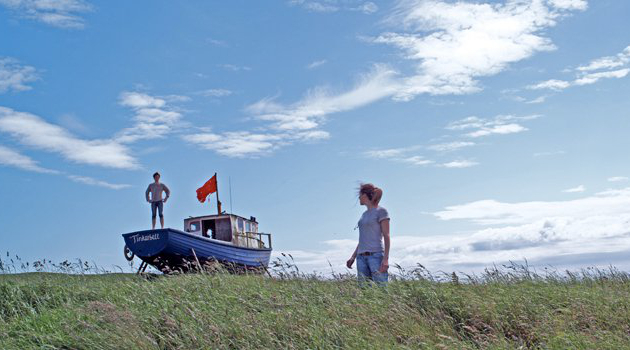 Blackbird is the story of a rural Scottish community. Ruadhan is a young drifter who is inspired by the local elders and their folk singing, but who sees their way of life gradually slipping away. Ruadhan lives in a boat on the land of town bard Alec and generally scavenges off the lives of others, but as the town’s traditions appear under threat, his own way of life is the one most under threat. 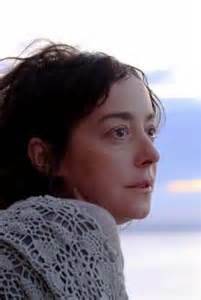 Woven through Blackbird are the Scottish folk stylings of luminaries such as Norman Maclean and Sheila Stewart, who both lend their voices to the film. Despite no prior acting experience, Maclean helps to ground the film and give it a sense of realism as well as adding his distinctive sound to the music, which is the highlight of Blackbird. The film’s primary let-down is in its narrative, which never manages to convince in either Ruadhan’s plight or his eventual fate. Some decent performances and Chambers’ skill as director, which seems to be better than his writing, keep Blackbird watchable but leave it falling short of anything more. I finished the day with Jeanie Finlay’s latest music documentary. Finlay was in attendance, glammed up and introducing the film with a simple “I think you should watch the film and decide if you like it, and then we’ll talk afterwards.” That pragmatism and directness is well reflected in Finlay’s doc, which tells the story of two more Scottish singers, this time rappers who couldn’t get into the hip hop industry as themselves, so reinvented themselves with American accents and fake backstories and who suddenly found themselves welcomed by managers and agents alike, with a route into the big time seemingly guaranteed for as long as they could keep up the pretence. Finlay’s latest effort isn’t quite as effective as her previous visit to the festival with Sound It Out, which was the intriguing story of a northern record shop. Here my main obstacle was with the animation which is used to flesh out the parts of the story documented by the fake Americans; it’s so stylised that it never quite gelled with the rest of the material. However, Gavin Bain and Billy Boyd – otherwise known as Silibil n’ Brains – were generally charming and likeable, even if you could never quite tell if the unreliable narrators were truly becoming reliable in their old age. 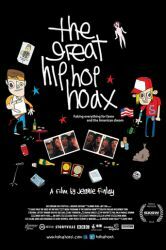 The Great Hip Hop Hoax’s strength lies in the uncertaintly of the outcome, and Finlay structures her story well in that sense. However, the Q & A afterwards threw up even more intriguing details which suggest a director’s cut in a few years may have an even more fascinating story to tell, as they are now both recording again after having been reunited by filming for the documentary. Silibil n’ Brains might be a thing of the past, but Bain and Boyd may yet find fame, or at least some form of infamy, and Finlay has another solid film to add to her CV. This entry was posted in Cambridge Film Festival, Reviews and tagged 2013, All The Light In The Sky, Blackbird, Cambridge Film Festival, film, Fireworks Wednesday, movies, review, The Great Hip Hop Hoax. Thanks, @MovieEvangelist – the one film that we had in common from that day’s viewing is Blackbird, where I agreed with the strengths in weaknesses in what I sought to write in my review.